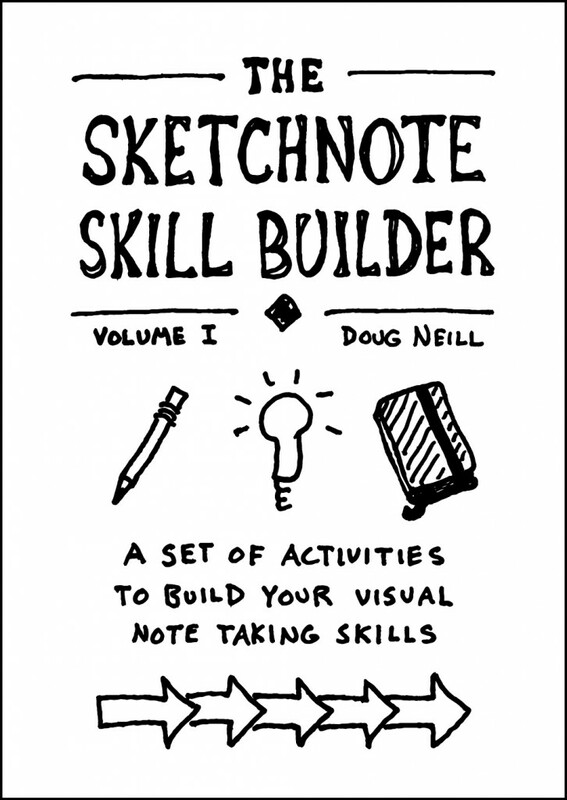 I have nearly finished Sean McCabe’s Skillshare course on turning hand-drawn sketches into digital vector illustrations, and here’s what I have to show for it: a cover graphic for The Sketchnote Skill Builder! While this might not look radically different from the initial sketch of the cover that I posted a few weeks ago, this image here has the advantage of being fully vectorized and is ready to be dropped into InDesign prior to sending the book off to the printer. I enjoyed Sean’s course immensely, and picked up a number of useful tips when working with Photoshop and Illustrator. I’m a novice with those programs, so seeing things as simple as setting up your own keyboard shortcuts was a huge benefit. Learning the overall process for creating vector graphics from hand-drawn sketches could lead to some interesting new projects. I’ve already got a few in mind, but I’d better finish up this one first! What’s left for The Sketchnote Skill Builder is to follow the same sketch-to-vector process for each page of the book. Unfortunately I have yet to finish all of the sketches for the activities that will make up the meat of this resource. But that might end up being a blessing in disguise. My new approach is to focus on one activity at a time – first sketching it out, then scanning it in, converting it to a vector graphic, and laying it out just right. By going through that entire process with one activity before moving on to the next, I’ll develop a feel for how precise I want my notebook sketches to be. I imagine there is an ideal ratio of time spent drawing compared to time spent touching up that drawing digitally. It will take experimenting to find that ideal ratio. For now, having completed Sean’s course and coming out of it with a cover for the book, I feel accomplished. So I’m giving myself a pat on the back, and then moving on to the next steps!